In construction, a building or structure is waterproofed with the use of membranes and coatings to protect contents, and structural integrity. The waterproofing of the building envelope in construction specifications is listed under 07 - Thermal and Moisture Protection within MasterFormat 2004, by the Construction Specifications Institute, and includes roofing and waterproofing materials. Tanking: This is waterproofing used where the below-ground structure will be sitting in the water table continuously or periodically. This causes hydrostatic pressure on both the membrane and structure, and requires full encapsulation of the basement structure in a tanking membrane, under slab and walls. Damp proofing: This is waterproofing used where the water table is lower than the structure and there is good free-draining fill. The membrane deals with shedding of water and the ingress of water vapor only, with no hydrostatic pressure. Generally, this incorporates a damp proof membrane (DPM) to the walls with a polythene DPM under slab. With higher grade DPM, some protection from short-term Hydrostatic pressure can be gained by transitioning the higher quality wall DPM to the slab polythene under footing, rather than at the footing face. Another specialized area of waterproofing is roof top decks and balconies. 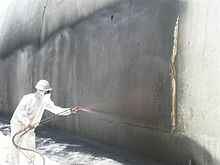 Waterproofing systems have become quite sophisticated and are a very specialized area. Failed waterproof decks, polymer or tile, are one of the leading causes of water damage to building structures, and of personal injury when they fail. Where major problems occur in the construction industry is when improper products are used for the wrong application. While the term waterproof is used for many products, each of them has a very specific area of application, and when manufacturer specifications and installation procedures are not followed, the consequences can be severe. Another factor, is the impact of expansion and contraction on waterproofing systems for decks. Decks constantly move with changes in temperatures, putting stress on the waterproofing systems. One of the leading causes of waterproof deck system failures is the movement of underlying substrates (plywood) that cause too much stress on the membranes resulting in a failure of the system. While beyond the scope of this reference document, waterproofing of decks and balconies is a complex of many complimentary elements. These include the waterproofing membrane used, adequate slope-drainage, proper flashing details, and proper construction materials. The penetrations through a building envelope must be built in a way such that water does not enter the building, such as using flashing and special fittings for pipes, vents, wires, etc. Some caulkings are durable, but many are unreliable for waterproofing. Also, many types of geomembranes are available to control water, gases, or pollution. From the late 1990s to the 2010s, the construction industry has had technological advances in waterproofing materials, including integral waterproofing systems and more advanced membrane materials. Integral systems such as hycrete work within the matrix of a concrete structure, giving the concrete itself a waterproof quality. There are two main types of integral waterproofing systems: the hydrophilic and the hydrophobic systems. A hydrophilic system typically uses a crystallisation technology that replaces the water in the concrete with insoluble crystals. Various brands available in the market claim similar properties, but not all can react with a wide range of cement hydration by-products and thus require caution. Hydrophobic systems use concrete sealers or even fatty acids to block pores within the concrete, preventing water passage. Sometimes the same materials used to keep water out of buildings are used to keep water in, such as pool or pond liners. New membrane materials seek to overcome shortcomings in older methods like polyvinyl chloride (PVC) and high-density polyethylene (HDPE). Generally, new technology in waterproof membranes relies on polymer-based materials that are very adhesive to create a seamless barrier around the outside of a structure. Waterproofing should not be confused with roofing, since roofing cannot necessarily withstand hydrostatic head while waterproofing can. The standards for waterproofing bathrooms in domestic construction have improved over the years, due in large part to the general tightening of building codes. Some garments, and tents, are designed to give greater or lesser protection against rain. For urban use raincoats and jackets are used; for outdoor activities in rough weather there is a range of hiking apparel. Typical descriptions are "showerproof", "water resistant", and "waterproof". These terms are not precisely defined. A showerproof garment will usually be treated with a water-resisting coating, but is not rated to resist a specific hydrostatic head. This is suitable for protection against light rain, but after a short time water will penetrate. A water-resistant garment is similar, perhaps slightly more resistant to water but also not rated to resist a specific hydrostatic head. A garment described as waterproof will have a water-repellent coating, with the seams also taped to prevent water ingress there. Better waterproof garments have a membrane lining designed to keep water out but allow trapped moisture to escape ("breathability")—a totally waterproof garment would retain body sweat and become clammy. Waterproof garments specify their hydrostatic rating, ranging from 1,500 for light rain, to 20,000 for heavy rain. Waterproof garments are intended for use in weather conditions which are often windy as well as wet, and are usually also wind resistant. Waterproofing methods have been implemented in many types of objects, including paper packaging, cosmetics, and more recently, consumer electronics. Electronic devices used in military and severe commercial environments are routinely conformally coated in accordance with IPC-CC-830 to resist moisture and corrosion but encapsulation is needed to become truly waterproof. Even though it is possible to find waterproof wrapping or other types of protective cases for electronic devices, a new technology enabled the release of diverse waterproof smartphones and tablets in 2013. This method is based on a special nanotechnology coating a thousand times thinner than a human hair which protects electronic equipment from damage due to the penetration of water. Several manufacturers use the nano coating method on their smartphones, tablets, and digital cameras. A 2013 study found that nanotextured surfaces using cone forms produce highly water-repellent surfaces. These nanocone textures are superhydrophobic (extremely water-hating). British Standards Institution BS.8102:2009 - "Protection of Below Ground Structures against Water from the Ground". Wikimedia Commons has media related to Waterproofing. ^ Lucy Shakespeare, 09-09-2016 (9 October 2016). "The Difference Between Waterproof & Water Resistant - Inside the Outdoors". Mountain Warehouse. Retrieved 23 May 2017. ^ "Waterproof phones and tablets make a splash". CNN. March 5, 2013. Retrieved October 28, 2016. ^ U.S. Department of Energy/Brookhaven National Laboratory (October 21, 2013). "Nano-cone textures generate extremely 'robust' water-repellent surfaces". ScienceDaily. Retrieved October 22, 2013. ^ Checco, Antonio; Atikur Rahman; Charles T. Black (October 21, 2013). "Robust Superhydrophobicity in Large-Area Nanostructured Surfaces Defined by Block-Copolymer Self Assembly". Advanced Materials. doi:10.1002/adma.201304006. Look up waterproofing in Wiktionary, the free dictionary.